In the early stages of the game, Southampton’s approach against the ball was key in setting the flow of the game. Without the ball, they would drop into a 4-4-2-0 shape, with no press on United’s backline. The two forwards, Gabbiadini and Tadic, were focused on blocking United’s midfield pair. This manifested in using cover shadows to block passes if United’s midfielders were positioned behind them, or moving slightly out of position to mark or press if Pogba and Herrera dropped into deeper positions. The intended effect was clear, Puel aimed to make United reliant on longer passes and/or dribbles from Smalling and Bailly. With neither of them possessing strong distribution skills or being particularly comfortable on the ball; succeeding in this would de-stabilise United’s build-up and generally reduce the threat. Alternately, the defensive scheme would cause Pogba and Herrera to drop deeper and thus have generally weaker connections to the likes of Mata and Lingard. This would also force more direct passes, giving Southampton more time to create access and generally make United’s play more predictable. In reaction, Herrera and Pogba began dropping deeper and wider in the half spaces. This positioning would either give them the necessary separation from Southampton’s forwards to enjoy time on the ball. Or it would create large gaps in the centre of the field if Gabbiadini and Tadic moved out of position to mark them. This ended up giving the United midfielders more time on the ball, with Southampton’s forwards wary of totally vacating the centre. At times this wide positioning from United’s double pivot opened space in the centre between Gabbiadini and Tadic, with the ball-near forward moving out to press United’s ball-carrying midfielder. In these situations, United often used Mata or Lingard to drop into this space to receive from the centre backs. However, they would often be pressed immediately by Davis to prevent them turning out, forcing them to return the ball to the centre-backs. This could have created routes to advance beyond Southampton’s midfield, however United’s advanced players often failed to re-adjust quickly enough to move into the space in Southampton’s structure. 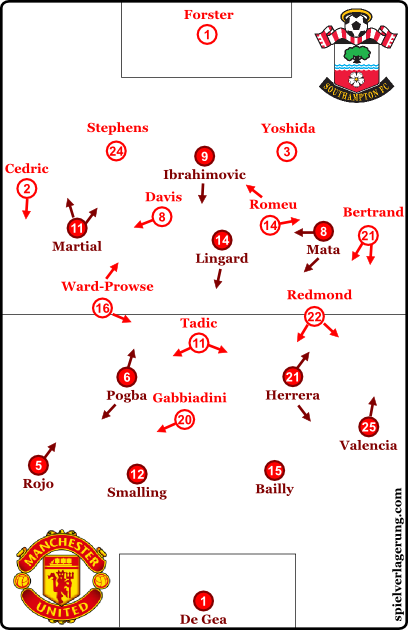 Despite greater time on the ball for the midfielders, United’s build-up was still largely ineffective. 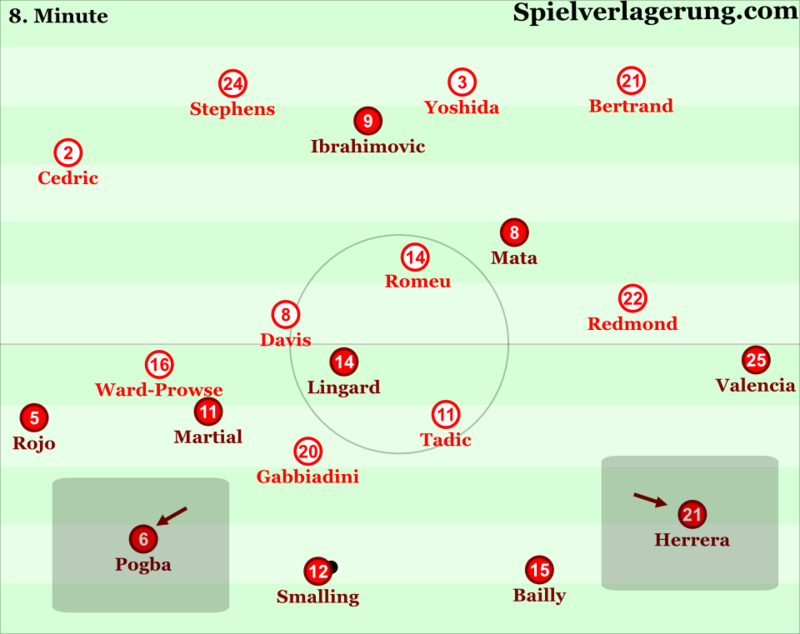 Their deeper positions now meant larger distances to players like Lingard and Mata, and they were unable to access these players to advance the game. Combined with the position-oriented covering from the Saints midfield, this caused United to play longer passes, either to Ibrahimovic in the centre or out to the wings. This inability to consistently progress against their opponents’ midfield press contributed to an uncertain start from Mourinho’s side. After going a goal ahead, United stopped pressing the Southampton backline, falling back into deeper positions earlier as they sought to protect their 1 goal advantage. However, Mourinho’s men had large issues in controlling important spaces whilst defending. Southampton were frequently able to access the 10 space due to weak covering from United’s midfield. 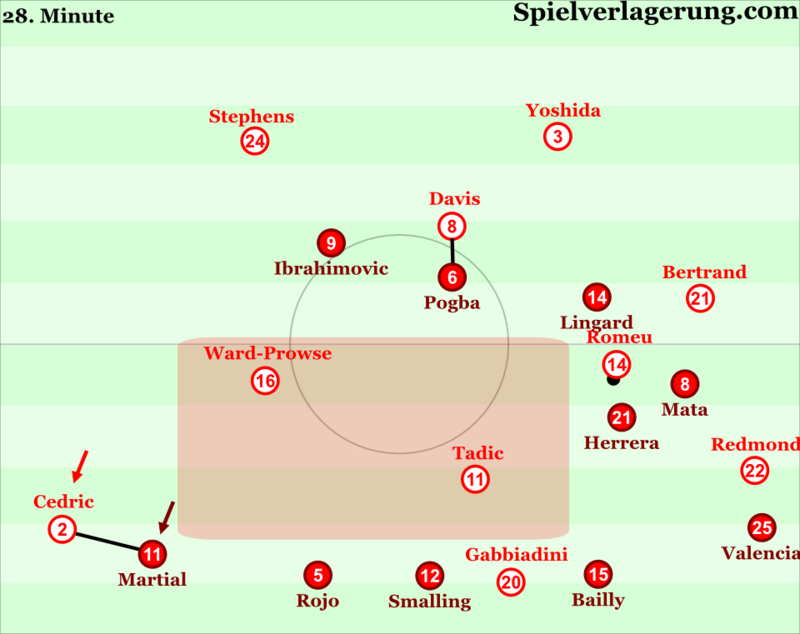 The biggest underlying cause behind this poor compactness was the individual approach to defending United employed. Man-orientations are quite common in high pressing phases, where teams seek quick and constant access to the opponents’ build-up. However, when teams defend in their own half, the level of man-orientations generally reduce as the effect of being closer to one’s own goal dictates that priority should be given to defending important central spaces. 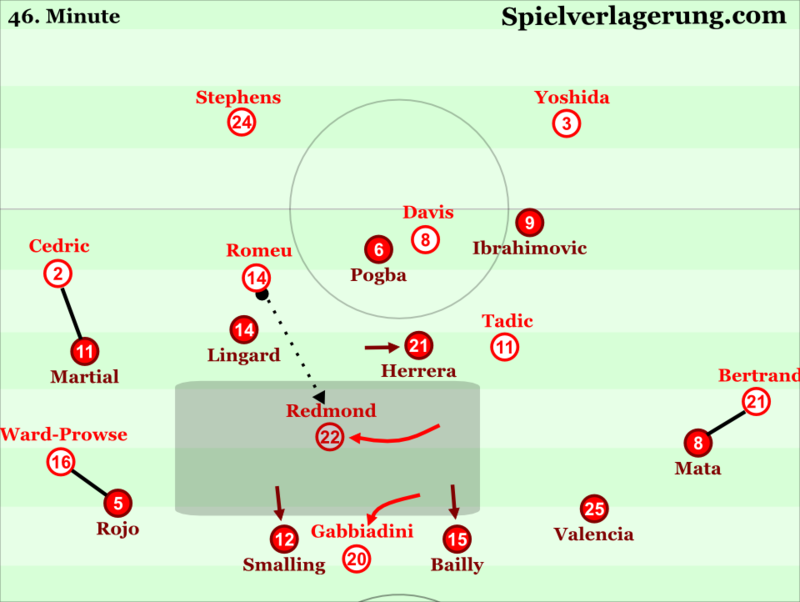 However even when defending in their own half, United seemed unwilling to lay their individual man-marking assignments aside to generate greater compactness and protect the centre of the pitch. Mata and Martial were often too occupied with maintaining close distances to Bertrand and Cedric respectively to support Herrera and Pogba in controlling central areas. 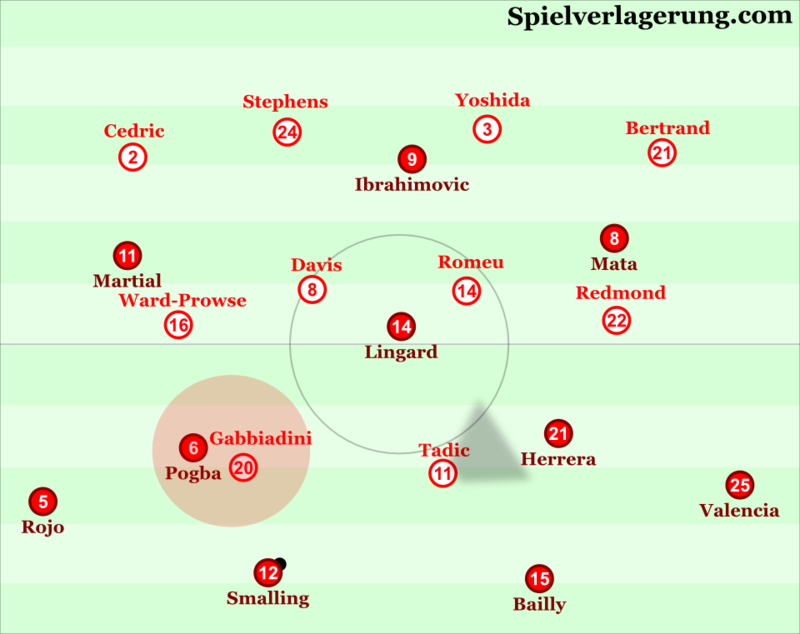 United thus displayed weak control of the half spaces, with the midfield pair given too much space to cover. Furthermore United’s ball-far central midfielder was often occupied with marking their opponent to shift across and cover their midfield partner. This meant the ball-near midfielder at times had to push forwards to press the ball carrier, with little support to help protect the space behind them. This was confounded by a general lack of group-tactical intensity in these defending phases, meaning the likes of Romeu had plenty of time to play passes into Redmond or Tadic. Alongside the alarmingly poor compactness from their opponents, Southampton displayed a number of interesting features that allowed them to take advantage of the space on offer. 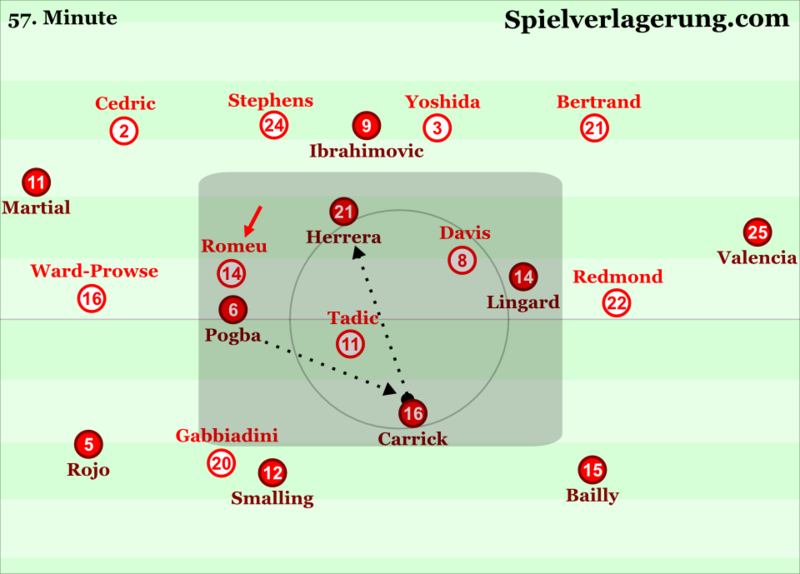 In situations where the receiver would face backwards pressing by Pogba or Herrera; they displayed strong individual receiving patterns to increase the available space. By dropping a shoulder towards the ball, before letting it run across them, the likes of Tadic and Redmond could create more space ahead of them to run into. Often, when players receive passes in the 10 space they are pressed by the opponents’ centre backs who aim to force them back by preventing turns. However this rarely happened to Southampton’s attacking midfielders, and this owed to the movement of Gabbiadini. By threatening to run in behind in these situations the Italian could take United’s centre backs into deeper positions. This meant Smalling and Bailly would be moving away as the likes of Redmond received the ball behind United’s midfield, which made it simpler for the receiver to dribble forwards with the ball. When Southampton received these passes they appeared to have a clear plan for how to advance the attack. As part of United’s man-oriented defensive strategy, Southampton’s wide players were quite closely followed. This was particularly obvious with Rojo often following Ward-Prowse deep into midfield areas! The recipient of these passes to the 10 space would often dribble towards United’s backline with the intention of drawing United’s full-back into a more central position. This allowed them to free the wide player to the byline for a cross. Southampton’s cross selection also appeared to be quite prepared, with low crosses favoured to target Gabbiadini’s near post darting movements. All these aspects were clearly visible in Southampton’s opening goal, but the warning signs were there for United on several occasions beforehand. The 2nd half was characterised by an odd flow with neither side able to establish a consistent rhythm with the ball. Mourinho’s side showed some improvements in their ability to access advanced midfield areas against Southampton’s 4-4-2-0, this was due to a number of factors. Their most consistent route of progression in the first half was through the use of Rojo as a diagonal full-back. The Argentinian defender would often stay deep in early build-up, often in line with the centre-backs, which forced a longer pressing run from Ward-Prowse for access. If the Englishman blocked the diagonal passes inside effectively, Rojo would dribble infield against Ward-Prowse’s movement. More frequently however, he used this time on the ball to make diagonal passes infield. The movement of Martial to get free in these situations was crucial, by moving deeper and towards the centre he could create separation, with Cedric reluctant to follow him that far out of position. This continued to be a big factor in United’s build-up in the 2nd half. They were also able to progress through the centre. Carrick’s presence in deeper positions freed Herrera and Pogba to play more suitable roles in advanced positions. This contributed to United overloading Southampton’s midfield with the support of Lingard. With this overload, United could create a free man in the centre to break through Southampton’s midfield structure. However, the Old Trafford outfit were unable to create dangerous situations consistently from here. Their offensive presence suffered a bit from the focus on overloading midfield. Zlatan, Martial and Valencia were often the furthest forward, but played too far apart to have interact with one another since Martial and Valencia focused on giving width. Southampton’s second half was characterised by their inconsistent actions against United’s man-marking. For much of the game, Southampton reacted to the man-oriented coverage with a possession game focused on dynamic combinations, one-twos and 3rd man runs. To facilitate this, they had a highly variable positional structure. The dynamic positioning allowed Southampton’s midfielders to create small time frames with no pressure to receive the ball, before laying it off and bypassing the pressure that their marker would eventually create. In the second half, Southampton continued with this approach. They were, however, unable to consistently break through with these combinations. On a number of occasions they were able to open the centre well with intelligent movements, but lacked the follow-up movements to support the receiver and take advantage of the space on offer. This left receivers such as Ward-Prowse isolated against their direct opponents with their back to goal. On other occasions however, they were able to release 3rd man runners through the wings or half spaces in a similar manner to the first half. These situations led to their most dangerous moments in the 2nd half. Michael Caley’s expected goals model indicated Southampton’s superior chance quality with an expected goals figure of 1.3 to United’s 0.9 which supports the feeling of hard luck amongst Southampton players and fans alike. This figure doesn’t to be vastly different, but doesn’t include Gabbiadini’s wrongly disallowed goal. They can however be encouraged by their performance, in particular their flexible structuring and offensive gameplan. This victory represents Mourinho’s 4th EFL Cup triumph, a trophy he sees as vital in establishing a winning culture within his teams. His side are still chasing victory in the FA Cup and Europa League as well as aiming for a top 4 finish, however they will need to display stronger performances if they are to achieve these aims. The recent fixture pile-up can be partially attributed to the weak performance. However the flaws in the defensive coverage were part of a strange defensive strategy from Mourinho, and they lacked a strong offensive rhythm to consistently create chances. Should that be the other way around? The weak performance can be partially attributed to the recent fixture pile-up? Very good article, thanks. It seems bringing Carrick on for Mata solved the issue of Pogba’s and Herrera’s defensive weakness.